Worship Study and Worship Symbols : Reform worship. This year our Worship Music Ministry is slowly going through Robert Webber's Together We Worship: Recovering God's Story. This short book is meant to be studied everyday over the course of thirty days, one 2-3 page session per day. 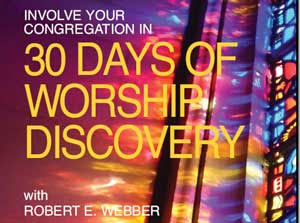 The book is actually part of Webber's 30 Days of Worship Discovery, which includes a DVD and other resources. We have customized it to our ministry's needs, reading and discussing one session of the book every two weeks. There are a couple questions at the end of each session, and so I start an email every other Monday, to which we "Reply All" with our answers. The purpose of this study is for all thirty of us to expand our understanding of worship, getting to the roots of what we do in worship. I highly recommend leading your team members in this very accessible curriculum as an introduction to the deeper things of worship. Our team has already gone through the first four sessions of Together We Worship, and it has been awesome! We have learned that worship is primarily about re-presenting God's accomplishments (Day 1), the importance of a Trinitarian understanding of worship (Day 2), the story of the Father expressed in the language of mystery in our worship (Day 3), the story of the Son expressed in the language of story in our worship (Day 4). And yesterday we began our discussion about the story of the Holy Spirit expressed in the language of symbol in our worship (Day 5). Before reading it I would have had to rack my brain for any symbols we use in worship besides the bread and cup of communion. After reading this session I am awestruck by the regular symbols I have been overlooking, such as the assembly of believers symbolizing the welcoming nature of God, the ministry of believers symbolizing God's presence and power in our preaching and serving, and the Bible as a symbol to be festooned and read with enthusiasm. This really gets me thinking about our need to view these things as Holy Spirit symbols that communicate God's life-giving work. The last paragraph (p. 31) really got me thinking about how often we talk about the move of the Spirit in our church, and yet without these symbols we really have no tangible means of identifying with certainty His activity. The challenge for us is to recover how the Holy Spirit communicates God's life-giving work through signs and symbols. So, someone may ask, "Did you experience the worship of the Holy Spirit in such and such a church?" "Oh, yes! The welcome they gave me, the sense of servanthood there, the reverence with which they treated the Bible, and the way they celebrated the bread and wine. Yes, I was moved by the Holy Spirit, filled with the grace of the Spirit and was led by the Spirit into a deeper relationship with the triune God!" The truth is we can't just rely on our feelings or emotional experiences to be indicators of the Spirit's move. I am so grateful that our church is already committed to the four symbols Bob mentions here. Now I want to be more intentional about identifying them, and other symbols, for what they are: avenues through which the Holy Spirit fills us with grace and leads us into a deeper relationship with the triune God.